Lenovo has announced a couple new Thinkpad Yoga convertible laptops at IFA. Mostly, they’ve got the kind of upgrades you’d expect: thinner, faster, lighter. But as it happens, the most exciting thing is the decades-old tech powering the Yoga’s new Wacom stylus. Supercapacitors are kind of like batteries, insofar as both store electrical energy. But rather than taking hours to charge (or requiring a bulky, disposable alkaline cell), supercapacitors take seconds to juice up, and last for hours. That’s how the stylus in the new Yogas work: rather than having a AAA battery, like you’d find in the stylus of the Microsoft Surface, the Yoga has a tiny capacitor. Touch it against the charging contacts inside the laptop itself, and you’ll be good to go for two to four hours. 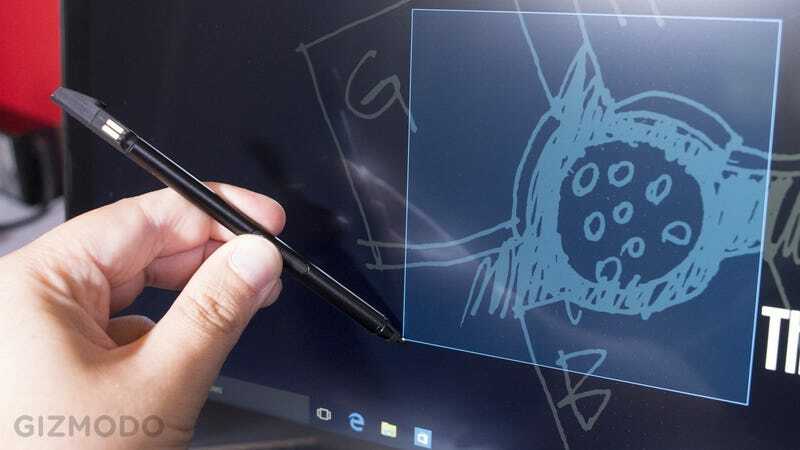 Not only is this good for bragging rights—does your laptop have a supercapacitor?—but it also means that Lenovo can make that stylus tiny and easy to hold. It’s far more pen-like than just about any other active stylus. And did I mention you never have to change the battery? The stylus comes integrated on two new Yogas: there’s 12” and 14” models, called the Yoga 260 and Yoga 460 respectively. The 260 has dropped 2mm and half a pound of weight compared to the previous ThinkPad Yoga, mostly thanks to switching exclusively to M.2 solid-state drives. There’s an option for 512GB of storage, but if you want a terabyte SSD, you have to jump up to the 14-inch 460. At 2.9 pounds and 18mm thick, the 12-inch Yoga 260 isn’t quite as svelte as Dell’s 2.6-pound XPS 13, but it’s pretty damn close. Apart from the thinner build, the physical design is mostly the same: that hinge can still bend a full 180 degrees to become a tablet (or anything in between), Lenovo’s fabled keyboard and love-it-or-hate-it nub is still there, and the styling remains unapologetically black (although there is a silver option). The 14-inch has the full range of ports you’d expect: three USB 3.0s, a full-size HDMI (finally! ), Mini DisplayPort, and an SD card reader. The 12-inch loses one of those USBs and the SD card in the name of portability, but does retain that full-size HDMI. One thing both versions do feature is a fingerprint sensor: unsurprising given Lenovo’s focus on security, but this one doesn’t require pulling your finger over the sensor. Just like the sensors built into new iPhones or Samsung Galaxies, you just have to place your finger on the button to unlock all those government secrets. Under the hood, things are standard Ultrabook fare: your choice of Intel’s latest 15w i3/i5/i7 Skylake processors, up to 16GB of RAM, and a couple different touchscreen options. The Yoga 260 has 1366 x 768 or 1920 x 1080 options—low-res compared to some of the competition, but given the small screen and Windows’ problem with hi-res screens, probably perfectly adequate. The Yoga 460 bumps those up to 1920 x 1080 and 2560 x 1440, respectively. Prices start at $949 and $1049 for the 260 and 460 respectively, although if you abuse the specs sheet, you can bump that up a few thousand dollars. The 260 lands in North America come November, while you’ll have to take out a Christmas IOU for the 460, which comes to these shores in January.